Blacktail Mountain is quintessential watermelon. This dark green cannon ball is shot full of flavor. Its dense scarlet flesh is sweet, juicy and crunchy. It was bred for early maturity by Glenn Drowns in the 1970’s. . . . The quintessential icebox watermelon that sets the standard for flavor. After that from an acknowledged expert, what’s not to like? (That’s it in the photo on the right.) Oh, and to add to the fun, other sources report that the Blacktail Mountain, while not what is called a “Christmas” or “keeping” watermelon, will keep for a couple of months or so—keep that in mind when considering quantities (a watermelon plant typically produces about two good watermelons, and this kind is in the 5- to 6-pound range). And it’s very early (75 - 80 days) and reportedly quite drought-resistant and tolerant of temperatures much lower than is typical for watermelons: one wonders why everyone, or at least everyone in a northern climate, doesn’t grow this sort; perhaps someday soon, they all will. Incidentally, if you are bedazzled by the idea of seedless watermelons—they sound so attractive, what with the seeds being such a pain in the elbow to deal with when eating the things—do be aware of two things: 1) most “seedless” types are only low-seed, not truly seedless (plus the seeds tend to be pale and not so easily seen); and 2) even experts find the things to be lousy growers, with hideously low germination rates and other problems too. And few or none are really early. When planning and planting, remember that your watermelons will come ready in a pretty narrow time window, and cannot easily be preserved past, at most, a couple of months; even if you like watermelon every day, be wary of overplanting—see the notes just above. We need to bring all of our heat-preserving weapons to bear on watermelons if we are to grow them well, or at all, in this climate—but it can be done. That arsenal needs to include (besides careful cultivar selection) plastic mulches, drip irrigation, row covers, Walls o’ Water and/or plastic water-filled bottles), wind protection (notably important for young melon plants), starting seedlings indoors, and careful transplanting out. Besides that general melon/watermelon information, note this: watermelon vines are particularly susceptible to air pollution—notably ozone, sulfur dioxide, and sulfur trioxide—which can seriously injure them. If we take as gospel the seedsmen’s claims of roughly 80 days from transplant for the early watermelon types, we want them set out about 40 days before our peak warmth, which occurs here around July 22nd; that translates to roughly June 12th, which is a satisfactory week or so past our “last expected freeze” date. It also projects readiness around September 1st, at which time daily highs are—on average— still around 80°, so we’re ok there, too. (Watermelons are said to grow best at temperatures between 75° and 85°.) Watermelon seedlings grow fast, and don’t want to spend too long before transplanting out—2 to a maximum of 4 weeks is the usual recommendation, with 2-3 weeks being usual. That means initially sowing our watermelon seeds around June 1st or a little before. Watermelons very much resent having their roots exposed or bunged about when the seedlings are transplanted, so it’s best to start your seedlings in a peat or cow pot, which can be transplanted entire (the plant grows right through the walls of the pot, which slowly dissolves). It is also a good idea to slightly overplant—use three seeds per pot—then thin, culling once the seedlings are big enough to let you know who’s who. Avoid excess water during germination. Before seeding, water the growing medium well, then allow excess moisture to drain; after that, give the medium a day or two for its moisture content to stabilize. Bring the medium to temperature—ideally 85° to 90° F.—before sowing seed; keep the seeds at that temperature, in the dark, till they germinate (heat pads help here). When the seedlings emerge, lower the temperature to, and then maintain it at, about 75°to 80°; and now supply light—16 hours under grow-lights of some sort is a good idea. Be sure to not let the soil (or peat) dry out—keep it constantly moist; but try, during the first week, not to overwater or have the soil soggy. Applying diluted fish emulsion twice a week also helps. Your watermelon bed should have full sun all day long. Watermelons prefer light, well-drained, sandy loam—they hate “wet feet” or compacted soil. Prepare your watermelon bed by digging well and deep, incorporating generous amounts of organic material as you go, for watermelons need rich soil. The pH wants to be a bit lower than the usual 6.8—somewhere between 6.0 and 6.7, but even a little lower will not hurt them (watermelons can tolerate as low as 5.0). Another thing your watermelon bed needs is at least some protection from wind, for young watermelon plants are easily harmed by brisk winds. You might grow a row of some fast-growing stalky plant—grain, for instance—somewhat to the windward of your watermelon bed, timing the planting to produce good growth by watermelon-transplant time; or you can consider some sort of mechanical windbreak. Don’t place a windbreak too close. Maximum benefit occurs at about 5 times the average height of the break; above 10 times, or below 2 times that height, there is little or no protection. Also, a windbreak that allows some air to pass through, like a picket fence (or a stand of grain) works better than a solid barrier of any sort. For a grain barrier, winter wheat varieties, rye, or oats make a good break—or spring barley for February plantings; sow thickly, 2-3 seeds per inch. About two weeks before you expect to actually set the transplants out, lay down your drip lines, then cover the bed with plastic mulch (or vice-versa, as you prefer). You can use black plastic, but the best for all melons seems to be the new green infra-red-transmitting sort. “Seal” the edges of the plastic by tucking them into the soil (or in any other clever way that occurs to you). How much space to give a watermelon plant is an interesting question. Jeavons, assuming a deep-dug bed, suggests an 18-inch spacing for those in the weight class of the Blacktail Mountain. More traditional techniques say about 24 inches for icebox types in rows, so the 18 inches for a deep-dug bed sounds about right. Mind, that’s just the plant’s basic home spot: if you don’t trellis, and multi-pound watermelons take a lot of trellising, the vines will sprawl over quite some area. Think it through. Water your transplants thoroughly to give them a good start in their new home. Immediately after, cover the beds with some sort of row-cover material (spun polyester has been recommended), for both warmth and insect protection. Keep a close eye on your young watermelon plants if the weather is warm: if they are showing signs of overheating (such as wilting), peel back the row cover. You can probably remove it for good, even if the plants haven’t set fruit yet, when daily highs settle down to at least the high 70s. Watering watermelons is a distinctly two-stage process. At the outset, in early summer, while they’re into their vegetative-growth phase, they need regular watering—though not to excess—which is why a drip system is so important. (Check the soil: with plastic mulch, the soil should retain moisture well, so don’t waterlog them.) Now: once the first fruit ripens on a plant, cut off its water, completely. Only if the plant looks positively wretched and shrivelling (a condition it shouldn’t get to with that mulch) should you supply any modest further water. Fail in this and the resulting watermelons will be bland and not sweet at all. It may not be necessary, but it’s probably wise to keep your watermelons out of direct contact with the soil or mulch, lest they molder or otherwise get moisture-damaged. Things like bricks or even plastic coffee-can lids, work. Knowing when to pick watermelons is crucial. Almost half of a watermelon’s final concentration of sugar occurs in the last week of maturation. During those crucial few days, the fruit passes from immature green to fully ripe. Some kinds are said to deteriorate seriously in eating quality as little as one day past their peak. On the other hand, to achieve the best flavor, sweetness, and size, watermelons need to stay on the vine till just that magic moment. As you get toward the expected ripeness time, check daily and harvest as necessary. The Blacktail Mountain is always described as about the earliest type; one seedsman lists it as 70 to 85 days; another, more precise, says 76 days. Oregon State University has stated that in the immediate lower Columbia River River area, maturity for ice-box types is typically 80 days from seed and so probably several days to a week later in our region. Putting all that together suggests a maturity, in an average year in this region, as perhaps 80 or so days. 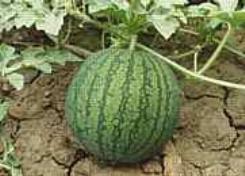 In any event, judging the exact ripeness of watermelons—which is important for this plant—is not a simple eyeball task: it is commonly remarked that “some experience is required to harvest a watermelon at its peak of perfection.” As a watermelon ripens, the ground spot (that is, where it is in contact with the ground or, one hopes, some support) will change from a pale green or white to cream or yellow; and the tendrils near the fruit stem will dry and turn brown. The sound of a ripe watermelon thumped with a finger is a muffled, dull tone; an immature fruit will instead yield “a clear, metallic, ringing tone.” Or so they say. Muskmelons & Watermelons - a really fine, in-depth site from Iowa State U.
Watermelons are members of the family Cucurbitaceae, which includes ordinary melons, cucumbers, and the squashes of all sorts (including pumpkins). The genus Citrullus, to which they belong, appears to include few or no other edible species. The scientific name of watermelon is sometimes given as Citrullus vulgaris, but that’s still the same species. Curiously, watermelons are a rarity among fruits, in that they have a high glycemic index. On the other hand, unless you’re a diabetic, you’d need to eat a lot of watermelon for that to matter much. Sub-Saharan Africa (the region of the great Kalahari Desert, to be precise) is considered the native home of the watermelon (Livingstone, in 1854, found it growing wild). From there it spread throughout the continent, including to Egypt (where the first recorded watermelon harvest occurred nearly 5,000 years ago), then on to India, and then China. By the 1600s, the watermelon had reached and spread throughout Europe (the word “watermelon” first appeared in an English dictionary in 1615). It was brought to the New World very soon after Europeans first landed here, both by the colonists and by African slaves, and its use was quickly picked up by the Native Americans: when the French arrived in the valley of the Mississippi River, they found the Native Americans there growing watermelons. Watermelons are recorded as having been grown as early as 1629 in Massachusetts, and prior to 1664 in Florida. Many years ago, the one of us who was at that time an “underground rock” DJ suggested to the world at large, after reading an AP story about newly bred spherical watermelons, that some incipient rock group should call itself “The New Improved Watermelon”. Now spherical melons are old hat, and the world’s latest New Improved Watermelon—well, you have to see it to believe it. You loaded this page on Friday, 19 April 2019, at 16:34 EDT. It was last modified on Sunday, 3 February 2019, at 19:04 EST.